If you've always wanted to learn how to scuba dive, Oceandivers can help you discover new adventures and see the wonderous world beneath the waves. The PADI Open Water Diver course is the world's most popular scuba course, and has introduced millions of people to the adventurous diving lifestyle. You can now book your Open Water courses online, scroll to the bottom of this page and click on the course date that you would like. 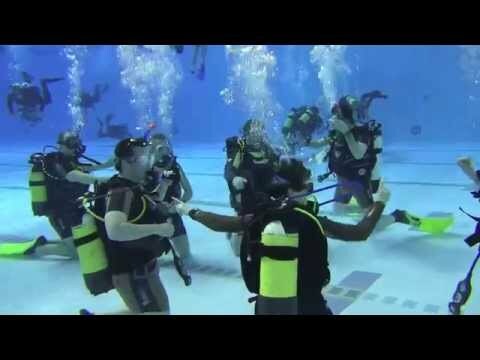 Confined Water Dives to learn basic scuba skills (5 pool training dives). Open Water Dives to review your skills and explore (4 open water dives). You need to be able to swim and be happy in the water to safely enjoy learning to dive. Your first breath underwater is something you'll never forget and you will progress through the skills from basic to more complex. 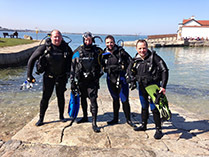 During the Open Water course, you'll make at least five pool dives in The National Aquatic Centre Blanchardstown (NAC) and four Sea dives at one of our local dive sites (usually Sandycove Beach) under the supervision of your PADI Instructor. In the PADI Open Water Diver course, you learn to use basic scuba gear and standard accessories. 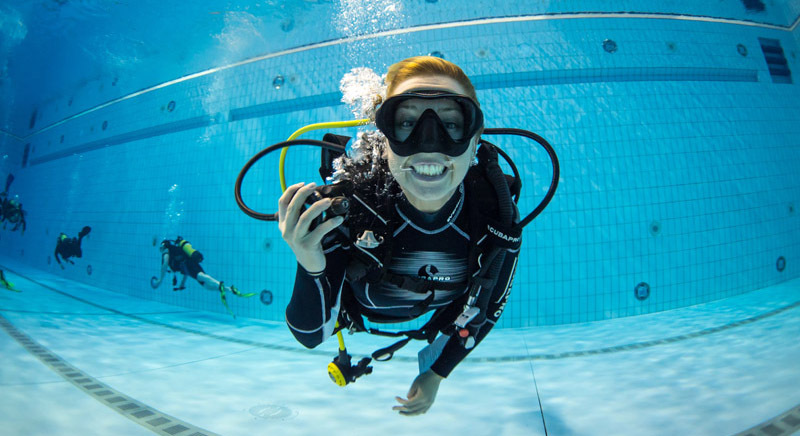 Oceandivers supply all the scuba equipment required by their students for the Open Water course, the use of our school gear is included in your course fee. PADI's Open Water Diver materials cover what you need to know about basic scuba diving skills, terminology and safety procedures. For each concept you'll read a description and watch a video demonstration. Then you'll head to the pool to practice these skills with your instructor. We typically run our Open Water courses over six weeks of evening classes meeting every Tuesday at 7.00pm in the National Aquatic Centre, Blanchardstown. The first part of the evening is classroom based followed by gear selection and assembly on the pool deck before an hour long in-water session of skills and fun in the pool. Finishing time each Tuesday is about 10.15pm. As well as evening classes, we also offer the full Open Water course as a 5 day Intensive programme during the summer months. The Intensive course meets on a Monday at 9.00am and continues each day from 9.00am till 5.30pm finishing on the Friday afternoon. If none of our normal schedule work out for you, let us know and we will do our best to accommodate you. Alternatively we also offer the Gold Open Water course that is tailored to your own individual schedule. Do feel free to give us a call or drop us an email but you will also find the answers to many common questions about learning to dive on our FAQs page here.